"Canvas Blocker (Fingerprint Protect)" extension manipulates two methods of HTML5 Canvas element that are commonly used to generate a unique fingerprint key for your browser. This extension slightly perturbs the actual image data only when these methods are called to prevent websites from generating this unique key. Whenever a suspicious method is called the extension notifies the user by displaying a desktop notification. Note that this extension uses non-persistent background page to have no effect on user browsing experience while it is not used. 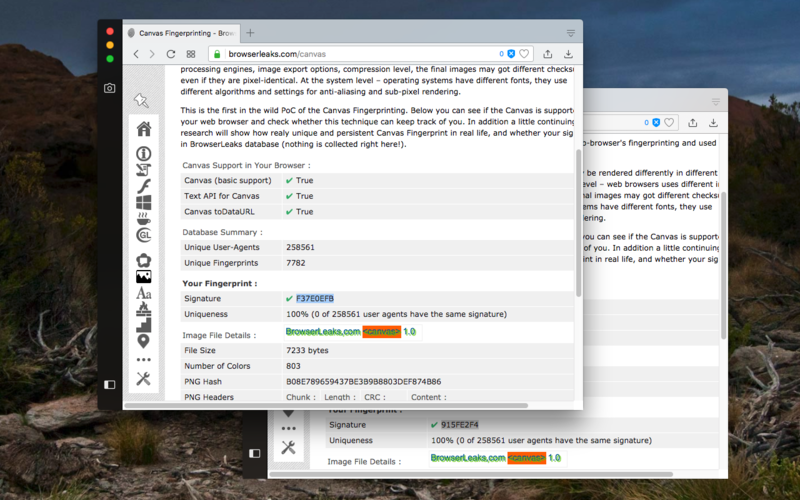 Also compared to other similar extensions, it uses a much faster and more optimized code to prevent fingerprints originated from the Canvas element. What is the "Canvas Blocker (fingerprint protect)" extension? How can I disable this extension? Normally there is no need for the extension to be disabled (if you find a case please report in the review section). So there is no toolbar button for toggling the enabling state of the add-on! If for any reason you would like to temporarily disable the extension, go to the add-on manager for your browser and press disable button. Then refresh the tab to refresh the server code. Make sure to re-enable the extension later on to prevent leaking. What are the differences between this extension and other similar ones? The method to manipulate internal functions need to be written with extra care to make sure the code is not affecting the page performance. This extension is written carefully by considering two important facts: 1. Do not slow down the borwser by applying most of the code when only needed. 2. Prevent fingerprint for all frames so that there would be no other ways to generate a unique key even by using new frame technice.